Israeli forces continued with systematic crimes, in the occupied Palestinian territory (oPt), for the week of 24 – 30 January, 2019. 3 Palestinian civilians, including a boy and a girl, were killed by the Israeli forces and settlers, in the West Bank. The girl was killed at a military checkpoint, under the claim that she attempted to carry out a stabbing attack. 24 civilians, including a child, were wounded. Israeli forces continued to use excessive force against peaceful protestors, in the Gaza Strip. A Palestinian civilian was killed while another succumbed to his wounds. 146 civilians, including 38 children, 4 women, a journalist, and 6 paramedics, were also wounded. In the Gaza Strip, the Israeli forces continued to use lethal force against the participants in the peaceful protests organized along the Gaza Strip borders, which witnessed the peaceful protests for the 44th week along the eastern and northern border area of the Gaza Strip. They also continued to use armed force as well during the incursions into the West Bank. In the West Bank, the Israeli forces killed a girl and a boy while another civilian was killed by Israeli settlers shooting. 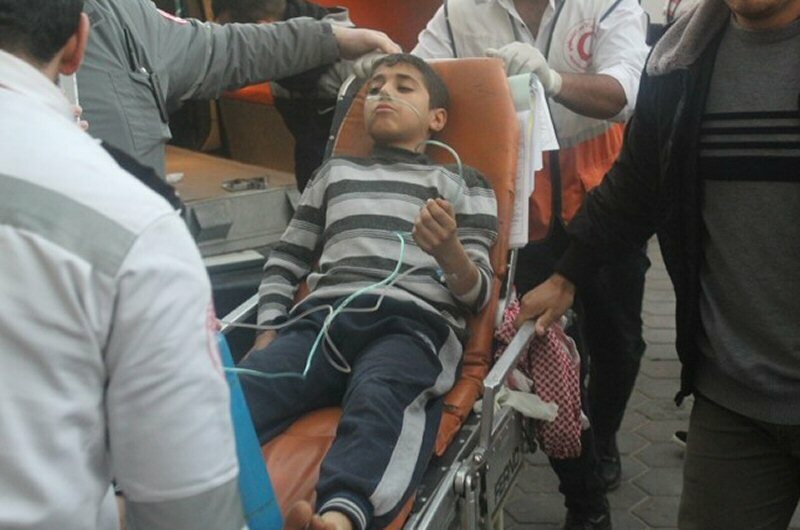 The Israeli forces wounded 24 civilians, including a child. In the Gaza Strip, the Israeli forces killed a Palestinian civilian while another one succumbed to wounds he previously sustained. 148 civilians, including 38 children, 4 women, a journalist, and 6 paramedics, were wounded. In the West Bank, in 2 separation crimes of excessive use of lethal force, Israeli forces killed a Palestinian child in Selwad village, northeast of Ramallah. After less than 24 hours, Israeli settlers killed a Palestinian civilian in al-Moghair village. On 25 January 2019, Israeli forces killed Ayman Hamed (16) while participating in a demonstration included 15 young men adjacent to the settlement road no. 60. In Selwad village, northeast of Ramallah. The Israeli forces opened fire at him from around 30-50 meters. Ayman was hit with a live bullet to the right side of his chest and immediately died. On 26 January 2019, a group of Israeli settlers moved into al-Moghayer village, northeast of Ramallah, and rioted on the streets while opening fire at several houses; 2 of them belonged to Jamal ‘Ali al-Na’asan and ‘Abdullah al-Na’asan, breaking all the houses’ windows. Meanwhile, dozens of Palestinian young men gathered to throw stones, empty bottles and Molotov Cocktails at them. In response, the settlers immediately and randomly fired a barrage of bullets, wounding Hamdi Taleb al-Na’asan (38) with a bullet that entered his lower back, hit the lungs and then exited from the chest. As a result, Hamdi fell on the ground and was immediately taken via an ambulance belonging to the Palestine Red Crescent Society (PRCS) to Palestine Medical Complex in Ramallah, where his death was declared in the ED due to arriving in a very critical condition. On 30 January 2019, in a new crime of excessive use of lethal force, Israeli forces killed a Palestinian girl at al-Za’eem military checkpoint, east of occupied East Jerusalem. According to PCHR’s investigations, at approximately 10:00, the Israeli forces stationed at al-Za’eem military checkpoint, east of occupied East Jerusalem, shot dead a Palestinian girl Samah Zuhair Mubarak (16), from Um al-Sharayet neighborhood, south of Ramallah. The Israeli forces alleged that Samah tried to carry out a stabbing attack. A video recording showed that the girl, at the time of the shooting, was wearing a niqab with nothing in her possession that shows an intention of an attack. Another video showed the girl lying on the ground and the Israeli forces searching her bag while there was a small knife next to her. Samah was in 11thgrade studying in Ramallah School. PCHR’s investigations are still continued, noting that the Israeli forces are still keeping Samah’s body until the reporting period. In the same context, during the reporting period, Israeli forces wounded 24 Palestinian civilians, including a child, in different shooting incidents. In the Gaza Strip, on 25 January 2019, Israeli forces killed Ihab ‘Abed (25), after being hit with a live bullet to the chest while participating in the Return and Breaking Siege March, east of al-Shawkah village, east of Rafah, south of the Gaza Strip. On 29 January 2019, medical resources at al-Shifa Hospital declared the death of Sameer Ghazi Mahmoud al-Nabaheen (47), from al-Nusirat. Sameer succumbed to wounds he sustained on Friday, 18 January 2019. Sameer was hit with a tear gas canister to the face while participating in the Return March in eastern al-Buriej in the center of the Gaza Strip. As part of using excessive force against the peaceful protesters along the Gaza Strip borders, during the reporting period, Israeli forces wounded 146 Palestinian civilians, including 38 children, 4 women, a journalist, and 6 paramedics. The injury of 5 of them were reported serious. As part of targeting the Palestinian fishermen in the sea, the Israeli forces continued to escalate their attacks against the Palestinian fishermen, indicating the on-going Israeli policy to target their livelihoods. During the reporting period, PCHR documented 9 incidents were as follows: 4 incidents west of al-Sodaniyia Shore, 2 incidents adjacent to al-Waha Shore, 2 incidents adjacent to Khan Yunis Shore, and one incident adjacent to Rafah. As part of targeting the border areas, on 28 January 2019, Israeli forces stationed along the border fence with Israel, east of Khan Yunis, south of the Gaza Strip, opened fire at lands located in the east of ‘Abasan al Jadida village, east of Khan Yunis. As a result, a 25-year-old male was hit with a live bullet to the right hand. On 29 January 2019, Israeli forces stationed along the border fence with Israel, opened fire at the border area, north of Beit Lahia, north of the Gaza Strip. As a result, a bulldozer driver was hit with a live bulelt to the neck and medical sources classified his wounds as serious. During the reporting period, Israeli forces conducted at least 72 military incursions into Palestinian communities in the West Bank. During those incursions, Israeli forces arrested at least 61 Palestinians, including 7 children. Among those arrested, 3 children were arrested by the Israeli police officers in Hizmah village, east of occupied East Jerusalem, after beating and harassing them. They were later released after taking them to the hospital to receive medical treatment. As part of the Israeli house demolitions and notices, Mohammed Sameer al-‘Abassy started to demolish 2 rooms of his house in Silwan village, south of occupied East Jerusalem’s Old City, after Israeli Municipality handed him a notice to self-demolish the two rooms under the pretext of non-licensing. It should be noted that al-‘Abassy self-demolished two 50-sequar-meter rooms of his house, which were built with tin plates, from 2 years and a half. On 30 January 2019, Israeli bulldozers demolished an apartment located above 3 shops in Wad al-Joz neighborhood in the center of Occupied East Jerusalem. These shops belong to Khaled al-Malahy, who received an administrative demolition notice on 28 January 2019. Al-Malahy mentioned that the first floor of the building was established 20 years ago, and includes a laundry, a garage and stores, while the second floor was established 5 years and includes 3 apartments, one of which was rented, the second one was prepared for his son and the third one was still under construction. Around the same time, Israeli bulldozers demolished a house belonging to ‘Essa Mohammed ‘Essa Ja’afra in ‘Ain al-loza neighborhood in selwad, south Occupied East Jerusalem’s Old City. The 60-square-meter house was sheltering 8 members, including 5 children. As part of settlement crimes and demolitions, Israeli forces backed by military vehicles and accompanied with a vehicle of the Israeli Civil Administration and a mounted-crane truck moved into Khelet al-Deir in Taqoo’ village, southeast of Bethlehem. Israeli soldiers deployed on the main street and in the vicinity of 2 barracks used for selling construction materials. Civil Administration workers began to dismantle and confiscate the 2 100-square-meter barracks under the pretext of non-licensing. The 2 barracks belong to Isma’il Naseer al-Sha’er and Mousa alem ‘Ayesh. On 30 January 2019, Israeli bulldozers demolished an under-construction house belonging to Mohamed Damidy in Hawarah village, south of Nablus. The house was built on an area of 120 square meters and its costs estimated at JD 30.000. As part of the Israeli settlers’ attacks against the Palestinians civilians and their property, PCHR’s fieldworkers documented during the reporting period 6 attacks carried out by Israeli settlers. As a result, 2 Palestinian civilians sustained bruises and 8 vehicles sustained damages. At approximately 15:30 on Saturday, 26 January 2019, a group of Israeli settlers moved into al-Moghayer village, northeast of Ramallah, and rioted on the streets while opening fire at several houses; 2 of them belonged to Jamal ‘Ali al-Na’asan and ‘Abdullah al-Na’asan, breaking all the houses’ windows. Meanwhile, dozens of Palestinian young men gathered to throw stones, empty bottles and Molotov Cocktails at them. In response, the settlers immediately and randomly fired a barrage of bullets, wounding Hamdi Taleb al-Na’asan (38) with a bullet that entered his lower back, hit the lungs and then exited from the chest. As a result, Hamdi fell on the ground and was immediately taken via an ambulance belonging to the Palestine Red Crescent Society (PRCS) to Palestine Medical Complex in Ramallah, where his death was declared in the ED due to arriving in a very critical condition. Following that, the Israeli forces moved into the village to provide protection for settlers and opened fire at the Palestinian protestors. As a result, 22 civilians were wounded with bullets and shrapnel; 8 of them were taken to the Palestine Medical Complex, 6 were taken to the Istishari Arab Hospital in al-Rihan Suburb, north of Ramallah, and 8 were taken to the medical center in nearby Termes’aya village. It should be mentioned that Hamdi al-Na’asan was a former prisoner in the Israeli jails, where he served an 8-year sentence. He was also married with 4 children; the youngest is only 1 year old. Yousef ‘Abed al-Rahman Zinnou (30), who works at the PRCS and was hit with a tear gas canister to the right hand. It should be noted that the first three paramedics work at the Palestinian Ministry of Health. Northern Gaza Strip: The Israeli shooting at Palestinian demonstrator resulted in the injury of 24 civilians, including 13 children, a woman and a paramedic. 9 of them were hit with live bullets and shrapnel and 15 were directly hit with tear gas canisters. The wounded paramedic was identified as Nour al-Deen Mahmoud Mansour (22). Nour is a volunteer paramedic at the Palestinian Red Crescent Society and he sustained a live bullet shrapnel wound to the left foot. Central Gaza Strip: The Israeli shooting at Palestinian demonstrator resulted in the injury of 18 civilians, including 8 children, a woman and a journalist. 7 of them were hit with a live bullet and 11 were directly hit with tear gas canisters. The injury of one of them was reported serious. The wounded journalist was identified as Hasan Hussain Hussni al-Jedi (26), from al-Nusirat. Hasan, who works as a cameraman at Shams News Agency, was hit with a tear gas canister to the lower limbs and treated on the spot. Khan Yunis: The Israeli shooting at Palestinian demonstrators, which continued until 17:30, resulted in the injury of 8 civilians, including 3 4 of them were hit with live bullets, 1 was hit with a rubber bullet and 3 were directly hit with tear gas canisters. Rafah: The Israeli shooting at Palestinian demonstrators, which continued until 17:30, resulted in the killing of Ehab ‘Atallah Hussain ‘Abed (25), who was hit with a live bullet to the chest, in addition to the injury of 28 others, including 7 children and a woman. 9 of them were hit with live bullets and shrapnel and 19 were directly hit with tear gas canisters. The injury of 2 of them were reported serious. At approximately 15:30 on Saturday, 26 January 2019, Israeli forces stationed along the border fence with Israel, east of al-Buriej camp in the central Gaza Strip, fired tear gas canisters and live bullets at Palestinian demonstrators, who were 100-200 meters away from the border fence in the Return Camp. As a result, a 14-year-old child, from al-Buriej camp, was directly hit with a tear gas canister to the lower limbs. At approximately 17:10 on Sunday, 27 January 2019, Israeli forces stationed along the border fence with Israel, east of al-Buriej camp in the central Gaza Strip, fired live bullets and tear gas canisters at Palestinian demonstrators, who were 100-200 meters away from the border fence in the Return Camp. As a result, a 22-year-old male, from al-Maghazi, was hit with a live bullet to the abdomen. The injury of him were reported serious and he was then taken to al-Aqsa Hospital in Dir al-Balah. When he arrived at the hospital, doctors quickly took him to surgery room and he was then admitted to the Intensive Care Unit (ICU). At approximately 14:45 on Tuesday, 29 January 2019, Israeli gunboats stationed offshore, and Israeli forces stationed along the border fence between the Gaza Strip and Israel, opened fire and fired sound bombs at dozens of Palestinian civilians who were at the Return camp along the border coastal, adjacent to adjacent to “Zikim”military base, northwest of Beit Lahia in the northern Gaza Strip. It should be noted that this is the 20th time for Palestinian boats to sail for Breaking the Siege. As a result, 23 civilians, including 6 children, a woman and a paramedic, were wounded. 10 of them were hit with live bullets and shrapnel, one was hit with a rubber bullet and 12 were directly hit with tear gas canisters. The injury of one of them was reported serious while the other civilians’ injuries were between minor and moderate. The wounded paramedic was identified as Naji Khadir Mohamed Salem (35). Naji, a volunteer paramedic at the PRSC, was hit with a tear gas canister to the back. The Israeli shooting caused fear and panic among a medical staff working in a medical point established by the PRCS, 2500 meter away southern the border fence with Israel. At approximately 15:30 on Tuesday, 29 January 2019, medical resources at al-Shifa Hospital declared the death of Sameer Ghazi Mahmoud al-Nabaheen (47), from al-Nusirat. Sameer succumbed to wounds he sustained on Friday, 18 January 2019. Sameer was hit with a tear gas canister to the face while participating in the Return March in eastern al-Buriej in the center of the Gaza Strip. He was then taken to al-Aqsa Hospital in Dir al-Balah. An hour later, he was referred to al-Shifa Hospital, where he stayed until his death was declared on Tuesday. Following the Friday prayer, on 24 January 2019, dozens of Palestinian young men and international human rights defenders headed to al-Risan Mount area located to the west of Ras Karkar village, west of Ramallah, in order to organize a peaceful demonstration in protest at confiscating and seizing their lands by the Israeli settlers. When the protestors arrived at the mentioned area, the Israeli forces fired live bullets, rubber bullets and sound bombs at them. As a result, a 22-year-old male was hit with a Two-Two bullet to the head and was then taken to the Palestine Medical Complex by a PRCS ambulance. Around the same time, dozens of Palestinian young men and international human rights defenders headed al-Naqqar area located in the northern side of al-Moghair village, northeast of Ramallah, , in order to organize a peaceful demonstration in protest at confiscating and seizing their lands by the Israeli settlers. When the protestors arrived at the mentioned area, the Israeli forces fired live bullets, rubber bullets and sound bombs at them. As a result, a 28-year-old male was hit with a rubber bullet to the foot. At approximately 20:00 on Friday, 25 January 2019, Israeli forces stationed at Za’tara checkpoint, south of Nablus, arrested Mohammed Ahmed Bani ‘Odeh (27), from Tamoon village, southeast of Tubas, taking him to an unknown destination. At approximately 15:00 on Sunday, Israeli forces backed by a vehicle of the Israeli Civil Administration intercepted a vehicle belonging to ‘Ammar Abu Qubaita, who works as a teacher at Jebna mixed school in Mssafer Yatta, southeast of Yatta, south of Hebron. The vehicle is used to transport teachers from and to the school. Around 3 hours later, the Israeli forces arrested Abu Qubaita, took him to an investigation center in “Kiryat Arba” settlement, east of Hebron, and confiscated the vehicle. On Monday, 28 January 2019, Israeli forces arrested Mohammed Robeen Shwaiky at a checkpoint established at Zeef village’s entrance, north of Yatta, south of Hebron. At Monday evening hours, 28 January 2019, Israeli Police officers arrested 3 children, from Hezma village, east of Jerusalem, after attacking and harassing a number of their families’ members. Fatma Zeyad Mohammed ‘Askar (20) said that she and her family were attacked by the Israeli Police after raiding her house located in “Pisgat Ze’ev” settlement, noting that her house was separated from the other parts of Hezma village by the annexation wall. She added that after she arrived the house at approximately 17:30, she was surprised with an Israeli police officer chasing her trying to arrest her. After that, her brothers intervened to prevent him from arresting her without a court’s order. It should be noted that she and her family were beaten. After she escaped from the police officer and headed to her house, the Israeli Police officers arrested Bashar Assad ‘Askar (17), his brother Ameer (15) and Majda Ahmad ‘Askar (17) and took them to Nabi Ya’qoub Police Station, where they kept them in custody for several hours for obstructing police work. At midnight, they were released and their family took them to the hospital to receive treatment because they were heavily beaten and their bodies showed signs of contusions and ecchymosis. Fatma was wanted because the police alleged that she put a suspicious object on the way near Hizma checkpoint, although she passes daily to go to the university as she studies Fine Arts in al-Quds University (Abu Dees). On Saturday morning, 26 January 2019, Mohammed Sameer al-‘Abassy started to demolish 2 rooms of his house in Silwan village, south of occupied East Jerusalem’s Old City, after Israeli Municipality handed him a notice to self-demolish the two rooms under the pretext of non-licensing. It should be noted that al-‘Abassy self-demolished two 50-sequar-meter rooms of his house, which were built with tin plates, from 2 years and a half. He added that the Israeli Municipality issued a decision to demolish the two rooms or it will implement the decision and he will pay the demolition costs. On Wednesday morning, 30 January 2019, Israeli bulldozers demolished an apartment located above 3 shops in Wad al-Joz neighborhood in the center of Occupied East Jerusalem. These shops belong to Khaled al-Malahy, who received an administrative demolition notice on 28 January 2019. Al-Malahy said that although he paid NIS 85.000 during 5 years as fines, the Israeli authorities demolished the building. It is worth to mention that due to successive demolition orders during 5 years, all residents left the three apartments that he was renting. Al-Malahy mentioned that the first floor of the building was established 20 years ago, and includes a laundry, a garage and stores, while the second floor was established 5 years and includes 3 apartments, one of which was rented, the second one was prepared for his son and the third one was still under construction. At approximately 15:00 on Wednesday, 30 January 2019, Israeli bulldozers demolished a house belonging to ‘Essa Mohammed ‘Essa Ja’afra in ‘Ain al-loza neighborhood in selwad, south Occupied East Jerusalem’s Old City. The 60-square-meter house was sheltering 8 members, including 5 children. It should be mentioned that the house was previously demolished in 2016, and included four 100-square-meter apartments. At approximately 10:00 on Monday, 28 January 2019, Israeli forces backed by 2 military vehicles and accompanied with a vehicle of the Civil Administration and a mounted-crane truck moved into Far’a area, southeast of Dura, southwest of Hebron. They confiscated iron utility poles used to support electric power lines under the pretext that the area is classified as Area (C). The incident happened after working for 15 days of supplying power from the power grid in Beit Ula village to Dura city and the nearby villages. Moreover, an Israeli Civil Administration officer handed the crew working on the power line a list of the confiscated poles. At approximately 13:00, on Tuesday, 29 January 2019, Israeli forces backed by military vehicles and accompanied with a vehicle of the Israeli Civil Administration and a mounted-crane truck moved into Khelet al-Deir in Taqoo’ village, southeast of Bethlehem. Israeli soldiers deployed on the main street and in the vicinity of 2 barracks used for selling construction materials. Civil Administration workers began to dismantle and confiscate the 2 100-square-meter barracks under the pretext of non-licensing. The 2 barracks belong to Isma’il Naseer al-Sha’er and Mousa alem ‘Ayesh. At approximately 09:30 on Wednesday, 30 January 2019, Israeli forces accompanied by a bulldozer and an Israeli civil administration vehicle, moved into the southern area of Howara village, south of Nablus. They stationed near Beeta village’s intersection. The bulldozers started to demolish a house under construction belonging to Mohammed Hassan Mohammed Dmaidy. Mohammed started to build the house one year ago and after poured the cement, the Israeli forces handed him a notice to stop construction work under the pretext that the house is located in C area. He added that he stopped the construction and submitted a complaint by a lawyer and then sessions started in the Israeli courts and no decision was issued until the day he was surprised by Israeli soldier who raided his house and started to demolish it. It is worth to mention that the house was built on a 120-square-meter land, which cost him JD. 30.000. At approximately 05:00 on Friday, 25 January 2019, a group of Israeli settlers, from “Shilo” settlement established on parts of Tarmass’eya village’s lands, northeast of Ramallah, punctured 3 tires of civilian cars, totally broke their glass and wrote slogans in Hebrew on walls in the village. Nedal Shehata (30) said that the settlers punctured his car’s tires. At approximately 20:00, a group of Israeli settlers from “Kiryat Arba” settlement, east of Hebron, stoned a house in al-Hasseen valley belonging to Hesham Jameel Abu S’aifan (54) who sustained bruises. They tried to raid the house located 10 meters away from the settlement and after residents around the house intervened and Israeli forces and the civil administration arrived, the settlers withdrew from the vicinity of the house. It should be indicated that the Israeli settlers continuously attack Abu S’aifan family living near “Kiryat Arba” The most violent attack against the family was in 2008 when a group of Israeli settlers caused the injury of two of S’aifan family members after opening at them. Moreover, they tried to burn the family’s houses for several times with Molotov Cocktails. It should be mentioned that the Israeli settlers almost-daily throw stones at those houses. At approximately 21:00 on Friday, 25 January 2019, a group of Israeli settlers from “Eli Zahav” settlement, gathered at Kafur al-Deek village’s entrance, west of Salfeet. They threw stones at Palestinian civilians’ vehicles passing by the area and no damages in the cars or casualties among the civilians were reported. At approximately 21:20, on Friday, 25 January 2019, an armed group of Israeli settlers moved into al-Ashqar valley, between ‘Enbta and Kafur Roman villages, west of Tulkarem. They patrolled in the area and then withdrew and no other incidents were reported. At approximately 10:00, on Saturday, 26 January 2019, 4 Israeli settlers from “Kiryat Arba” settlement, east of Hebron, attacked a group of Palestinian children playing among olive trees in al-Hasseen valley. They attacked the children with their hands and then left the place after being chased by the Palestinian residents in the area.